In an ever-expanding filmography ranging from Transporter to Taken and dozens of entries in between, Leon: The Professional helmer Luc Besson has proven that he has a seemingly endless supply of movie ideas. 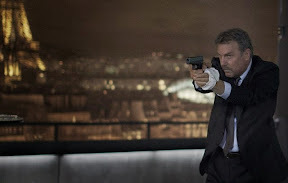 Primarily set in his native Paris, Besson scripts typically center around middle-aged action heroes (often played by the A-list headliners from Hollywood blockbusters of decades past) with enviable sets of James Bond-worthy skills they're forced to employ to protect the women in their lives from current to estranged lovers, wives, daughters and others in between. Amazingly prolific and frequently profitable, it’s almost as if Besson has crafted some sort of personally attuned B-movie plot generator that allows him to switch out a discerning characteristic, backstory or random subplot to ensure that each title differs ever so slightly from one to the next. And while audiences have been happy to overlook the messy contrivances of past works for the sake of good old fashioned popcorn movie entertainment, unfortunately, his latest offering 3 Days to Kill feels as fresh as microwave popcorn that's been reheated a number of times. From its illogical cut-and-paste style screenplay that serves up a new variation of a Besson B-movie plot with each passing scene – changing its storyline and tone at least four times within the very first act alone – to its sloppy production values, it's big budget trash of the highest order. Combining too many half-baked narrative ingredients with the ever-evolving characterizations of an unlikable cast of characters that grow increasingly bizarre as the film continues – like a recipe that’s been reconfigured multiple times, it’s no wonder when the messy soufflé that is 3 Days to Kill falls flat. One of the biggest problems is that the film tries telling so many stories at the same time that it loses sight of what actually made it compelling in the first place, which is arguably its strongest plotline about an over-the-hill former CIA operative who's faced with a final mission that will determine whether or not he receives the life-saving medical treatment he needs to fight another day. Needless to say, it’s a disappointing choice for a comeback film for the always affable Kevin Costner and his disenchantment with the work is easily decipherable given his lack of enthusiasm that permeates from start to finish as he sleepwalks through this uninspired tale. And while usually La Femme Nikita mastermind Besson has a gift for writing women, 3 Days is bogged down by too many unpleasant female characters including Amber Heard's sexually aggressive CIA handler who feels like she's walked into the frame directly after being kicked off the set of a Tarantino 2 Days in the Valley style ripoff. Furthermore, the immediacy of the killer plot hook is diluted with a generic subplot wherein Costner's walking midlife crisis tries to make amends with his estranged (and incredibly strange) teenage daughter played by Hailee Steinfeld. 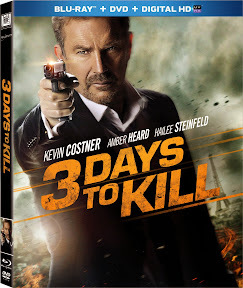 Had it been pared down to its essence, 3 Days to Kill could've been a taut, efficient, fast paced thriller with primal life or death stakes but the clever idea hatched by Besson and his From Paris With Love collaborator Adi Hasak is lost in the shuffle of director McG's overlong and overcrowded production. Underwhelming and irritating all around, in the end Besson's latest B-movie brainchild is actually bested by another topically similar recent B-movie in the form of the Aaron Eckhart thriller Erased (from helmer Philipp Stölzl), which manages to serve up a terrific balance of father/daughter bonding and operative on the run thrills. While it isn't enough to erase your memory of 3 Days or get rid of the taste of over-popped movie popcorn that the overdone overkill of Kill left behind, Erased is still the smarter choice in escapist European espionage fare of the Besson inspired kind.